At the Westfield quads on Sunday, I took these pictures. 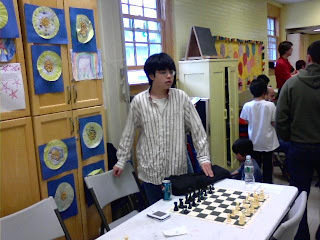 The first two pix feature teammates of mine from the USATE 2009: Atlantic Chess News editor Steve Ferrero and my chess student Ziping Liu. Next, there is a photo of blogger Polly Wright. The final three shots show the games from the top quad: Boris Privman versus Mark Kernighan [round one], Mark Kernighan versus Bill Freeman [round two], and Bill Freeman versus Boris Privman [round three]. Everyone in this quad, including me, is a national master. 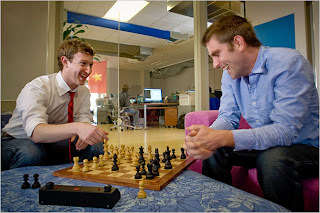 This photo [courtesy of Peter DaSilva] appeared in The New York Times on Sunday with the following caption: The masters of Facebook, Mark Zuckerberg, left, and Chris Cox, preside over a five-year-old company that is nearing a milestone of 200 million users, double the number last August. No wonder these two are successful! 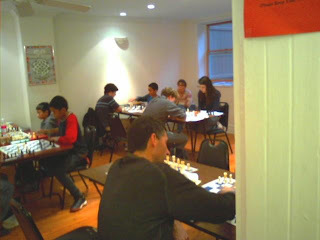 Nearly sixty players showed up in Westfield today for the game/45 quads where I finished with three draws. The top quad was comprised of four masters including myself. These are my games. 26.e5 Bb7 27.Re3 Rxe3 28.Kxe3 fxe5 29.f4 exf4+ 30.Kxf4 Re7 31.Re1 Rf7+ 32.Kg3 Kc7 33.Re8 Bd5 34.Re3, draw. 30.Kf1 Kf7 31.Ke2 Ke6 32.Kd3 c6 33.Ba4 Kd7 34.Kd4 Na6 35.g4 Nc5 36.Bc2 Ke6 37.h4 Nd7 38.f4 f5 39.g5 Nc5, draw. 38.Kf1 c5 39.dxc5 dxc5 40.bxc5 bxc5 41.Ke2 Ke5 42.Kd3 f5 43.Rb5 Kd6 44.Rb6+ Kc7 45.Rg6 Rb4 46.Rxg7+ Kb8 47.Re7 Rb2 48.Re2 Rb1 49.Kc3 Kb7 50.Re5 Rb2 51.Rxf5 Rxa2 52.Kb3 Ra1 53.Rxc5 a2 54.Ra5 Rg1 55.Rxa2 Rxg2 56.Kb4 Rh2 57.Ra3 Rxf2 58.Rg3 Rf6, draw. 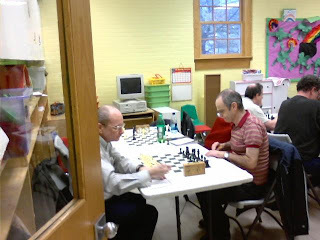 Today I participated in a game/60 Swiss at the Marshall Chess Club where I finished with a score of 2-0-2. Here are the games, including a draw that I swindled in the last round with only 11 seconds left on my clock! 32.Nh2 Nh4 33.Ng4 h5 34.Nf2 Nxg2 35.Nd3 Nh4 36.b4 axb4 37.axb4 Nf5 38.c5 bxc5 39.bxc5 Ng3+ 40.Kd4 Ne2+ 41.Kc4 Be7 42.Bd2 h4 43.Nf2 Ng1 44.c6 Nxf3 45.Ba5 Bd8 46.Kd3 Ne5+ 47.Ke4 Nxc6 48.Bd2 Ne5 49.Bc3 Nc4 50.Kf3 Bf6, White forfeits. 36.e5 f6 37.Bf3 b6 38.Bc6 fxe5 39.dxe5 g6 40.Bxe8 Kxe8 41.Ke4 Ke7 42.Kd5 h5 43.h4 Kd7 44.e6+ Kd8 45.Ke5 Ke7 46.a3, Black resigns. 35.Bd1 b5 36.cxb5 cxb5 37.f4 Bc5 38.Kf3 Bd4 39.b3 axb3 40.Bxb3 Kf6 41.h3 b4 42.Bc2 h6 43.g4 fxg4+ 44.hxg4 Bc3 45.Ke4 Bd2 46.f5 Bc3 47.Kd3 Be1 48.Kc4 Ke5 49.Bd1 h5 50.gxh5 Kxf5 51.Kd5 Kf6 52.Kd6 Kg7 53.Ke7, draw. 49.Ke5 Nxe6 50.Rb4 Nxg5 51.Rxb7+ Rd7 52.Rb6 Nf7+ 53.Ke4 Rc7 54.Kf4 Kf8 55.g4 hxg4 56.Kxg4 Kg7 57.h5 gxh5+ 58.Kxh5 c5 59.Kg4 c4 60.Kf4 c3 61.Rb1 Nd6 62.Ke3 c2 63.Rg1+ Kf7 64.Kd2 Ne4+ 65.Kc1 Nf2 66.Rf1 Ke6 67.Rxf2 Ke5 68.Rxc2 Rxc2+ 69.Kxc2, draw. 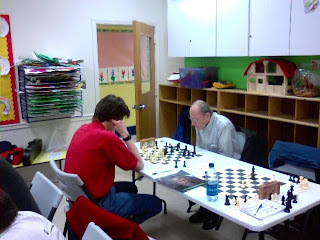 Here is an article on Paul Morphy, written by Tim Harding at Chess Cafe. It includes analysis of one of the most famous games in the Philidor Counter Gambit, namely Staunton and Owen versus Morphy and Barnes. 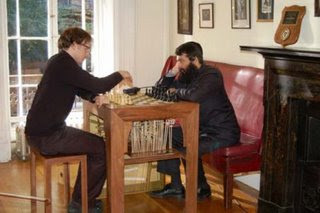 Guido van der Werve's film Nummer twaalf, featuring a game between the filmmaker and GM Leonid Yudasin that was played on a chess piano at the Marshall Chess Club, is currently on exhibition in the Netherlands. Liz Garbus is working on a documentary for HBO titled Madman Genius. It centers on Bobby Fischer, described by Garbus as "sort of the Muhammad Ali of chess." The film is in pre-production, with shooting to start probably this spring. 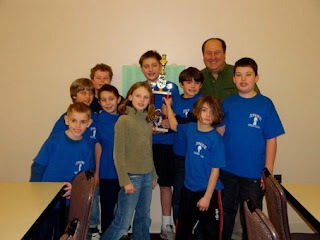 At the New Jersey Elementary Chess tournament, held on March 1st at Brookdale Community College, a team from Tewksbury Township schools finished in fourth place. They were coached by NM Scott Massey. 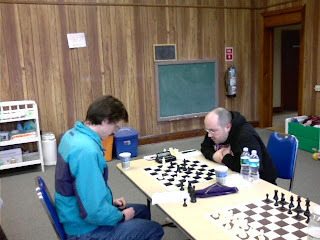 In my game against Jason Margiotta, played yesterday at the Marshall Chess Club, I nearly walked into 41.Rxh6?? Rc3#. 41.Kxc6 Rxb3 42.Rd7+ Ke8 43.Rd5, Black resigns. 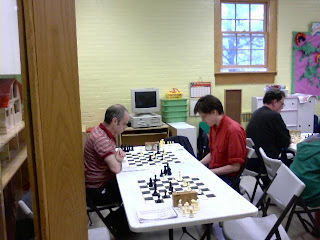 Yesterday, at the Hamilton quads, I started playing a Pirc against NM Mark Kernighan [pictured above, as White, in his second round game against NM David Grasso]. But the game turned into a defense resembling a Ruy Lopez! 48.Ra3 Rc5 49.c4 Ke7 50.Nb7 Rxc4 51.Re3+ Kf6 52.f3, draw. 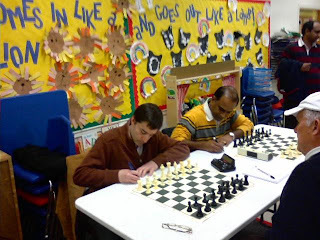 After reading this article, I have added the Monmouth Chess School and Club to my link list. At his Contre Gambit Philidor blog, Frederic Fournier provides a couple of links to recent posts of mine that include games where I successfully played the PCG. The above diagram shows the position after Yefim Treger's 15.Rxe4. I played the incorrect 15...Bf5 16.Ra4 a6 after which Treger missed the win of a pawn by 17.Rb1. On move fifteen, Black could have improved by 15...b5, 15...g6, or even 15...Bd7 with the idea of 16...Bc6. Did you know that Walter Tevis planned to write a sequel to The Queen's Gambit? Listen to his 1983 interview! 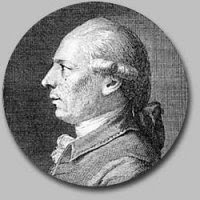 Besides being the leading chess player of his age, Philidor also composed operas. 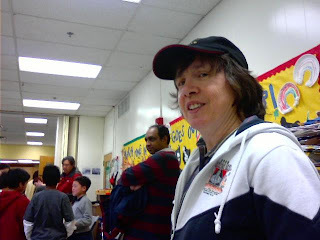 At Jim West Talks Chess, I have posted my win with 1.b3 against Yevgeni Margulis. 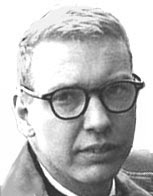 Frank Brady's Introduction on "YouTube"
Here, in two parts, is club president Frank Brady's introduction to the Bobby Fischer symposium, held at the Marshall Chess Club. 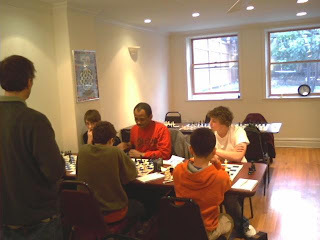 Finishing with a score of 2-1-1, I won this game in yesterday's game/60 Swiss tournament at the Marshall Chess Club. 32.Bf6 Nxf4 33.Bxd8 Rxd8 34.hxg5 hxg5 35.g3 Nxd3 36.Rxd3 c5 37.Kf2 Kg7 38.Ke2 Kg6 39.a4 b6 40.Kf3 Kf5 41.b3 g4+ 42.Ke2 Rh8 43.b4 Rh2+ 44.Kf1 Rb2 45.bxc5 bxc5 46.Ra3 a5 47.Ra1 Rb4, White resigns. USATE 2009 Photos @ "Diamondback"